GYROTONIC EXPANSION SYSTEM® coming to downtown Westfield NJ. Raritan Valley GYROTONIC® is moving and relocating to 111 Quimby street suite #9 Westfield NJ, 07090 beginning of May. Raritan valley Gyrotonic will be providing to Westfield New Jersey and the surrounding areas personalized high quality Gyrotonic and Gyrokinesis training. We welcome all ages, and Fitness levels. Whether working one-on-one, or in a small group session. We look forward to accommodating your unique needs and specific goals. 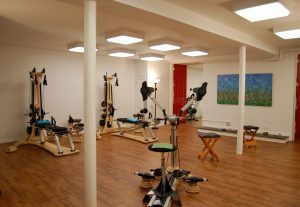 Our mission is being an authentic representative of Gyrotonic in our community and establishing a reputation as an authentic and high-end quality Gyrotonic and Gyrokinesis studio. Offering Gyrotonic and Gyrokinesis sessions taught based on the authentic curriculum. 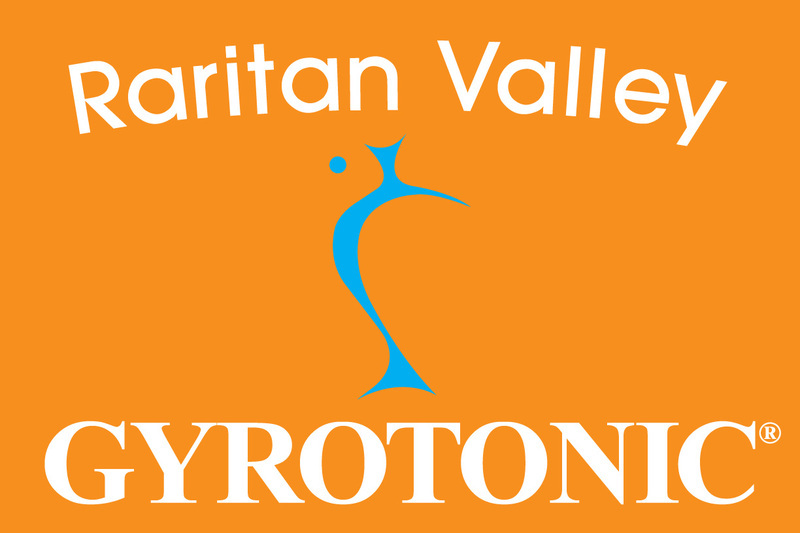 Raritan valley Gyrotonic is a boutique studio specializing exclusively in the GYROTONIC EXPANSION SYSTEM®. The GYROTONIC EXPANSION SYSTEM® is composed of Gyrotonic and Gyrokinesis exercise methods. The Gyrokinesis program, originally called “Yoga for Dancers,” which works the entire body without equipment by stimulating internal organs through fluid and gentle manipulation of multiple joints; and Gyrotonic training, which uses apparatus that permits the person to move with support and resistance. Both forms of exercise allow the body to work in continuous, flowing movements and are synchronized with corresponding breathing patterns. Advocates of the work say it enhances aerobic and cardiovascular stimulation and promotes neuromuscular rejuvenation. Gyrotonic exercises are performed on custom-designed Gyrotonic equipment, whereas Gyrokinesis exercises are performed on a mat and chair. Both Gyrotonic and Gyrokinesis exercise sequences are composed of spiraling, circular movements, which flow together seamlessly in rhythmic repetitions, with corresponding breath. Each movement flows into the next, allowing the joints to move through a natural range of motion without jarring or compression. These carefully crafted sequences create balance, efficiency, strength and flexibility. For New clients we have a special offer 3 private sessions $195 Personal GYROTONIC® Sessions are customized to meet your personal goals. Because the GYROTONIC® method is progressive, we can start where you are, regardless of your fitness level. *The GYROTONER®, which duplicates the movements of the human body in multiple planes, is beneficial for shoulder, elbow and wrist rehabilitation. It has handle and foot units that operate either separately or together. *The Jumping Stretching Board, a versatile apparatus that stretches and strengthens the torso, is especially useful for lateral movement of the lower limbs. 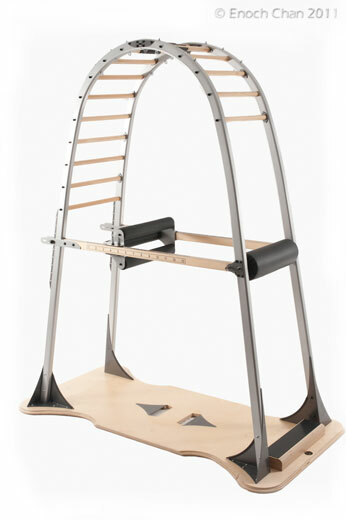 *The Archway is designed to increase proprioceptive understanding and enable optimum stretching. *The Leg Extension Unit, used for the lower body, is considered effective for knee, foot and ankle therapy. All the equipment is designed to provide joint articulation without compression, the goal being to distribute the work evenly between agonist and antagonist muscle groups. The apparatus accommodates all body types and strength levels. 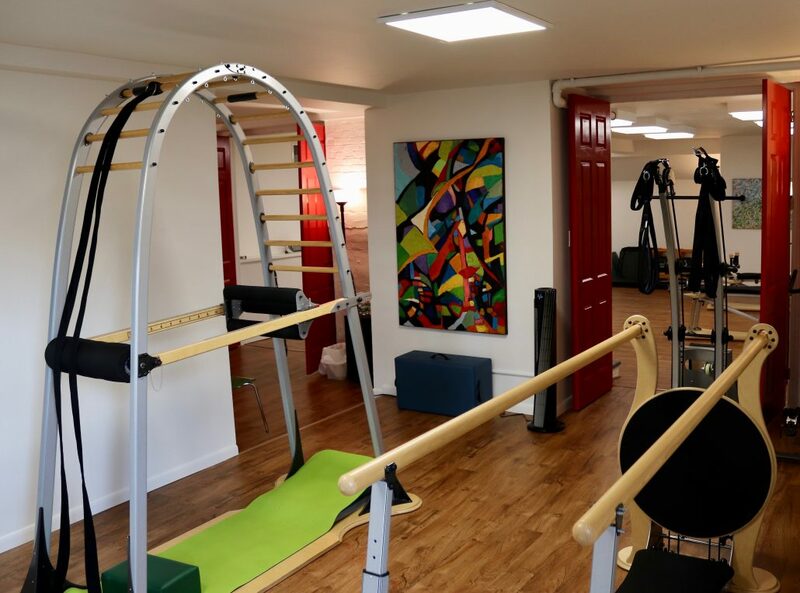 It is currently being used in therapeutic, dance, sport-specific and general conditioning facilities, in addition to Gyrotonic exercise studios. NEW to the schedule is Gyrotonic Duet sessions share the class with a friend or partner. GYROTONIC® pulley Tower Duet class, 2 person class. The Gyrotonic Pulley Tower is elegantly designed around the human form to assist with exercises that use Gyrokinesis principles. 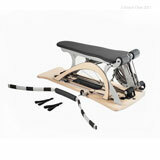 The equipment allows more power and support while counterbalancing, creating space in the joints. The system is fully adjustable and can meet the needs of varying body types and levels of strength. The flowing, 3-dimensional, circular, spiral, twisting and undulating patterns that characterize the system help to increase the functional capacity of the spine. 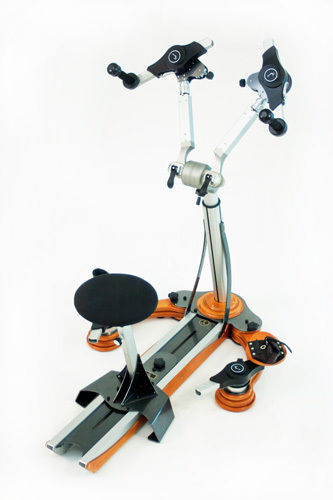 The Pulley Tower Combination Unit is the most widely used piece of Gyrotonic Equipment. It is the result of over thirty years of research and development. The pulley tower provides smooth, even support and resistance via a unique, weighted pulley system, adjustable bench and rotating handle. Rhythm and Flow is the key to the class working the entire body from head to toes from inside to the outside! Some of the benefits Increased functional capacity of the spine, better coordination, overall increased strength, flexibility and Increased mobility of the joints and the use of the fullest capacity in all directions and Improves circulation with an excellent cardio benefits. Raritan Valley Gyrotonic will also be offering small Group Gyrokinesis classes 3-4 person classes. Gyrokinesis for me is the foundation of the entire method!!! A Gyrokinesis class is done without equipment, using a stool and mat. The classes are 60-90 minute. 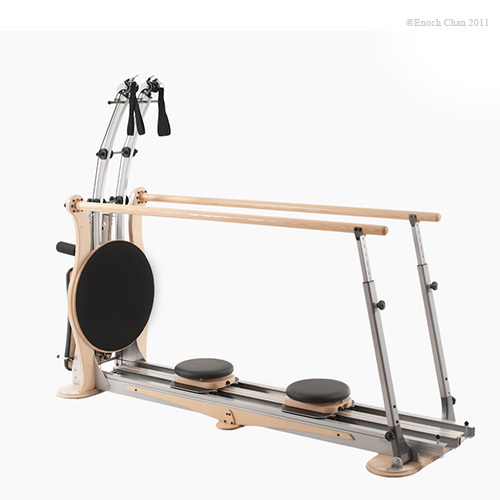 certified GYROTONIC® and GYROKINESIS® trainer and an authorized GYROTONIC® and GYROKINESIS® Pre-trainer. She is certified in all Specialized Gyrotonic equipment.